By day, Joe Giaquinto is a computer guy—on nights and weekends, he is a psychic-medium and ghost investigator. He has experienced otherworldly phenomena in and around New York City and Long Island for over thirty-five years. His first official ghostly encounter occurred in upstate New York, when he unknowingly moved into a haunted house. Over the years that followed, his many encounters with the paranormal helped him develop his intuitive ability as a medium. As an artist, Joe has been also fortunate to make a connection with the spirit world through his camera, channeling ghostly images through the lens, with a combination of photographic and drawing skills. The results are beautiful, impressionistic artworks, which can be faces, objects, places or even text messages. People often ask Joe who painted his art and are surprised when he tells them they are photographs. Once, Facebook even asked Joe to tag one of his images as a Facebook friend! Joe believes our spiritual universe is a beautiful place. He feels fortunate to share its art with everyone. 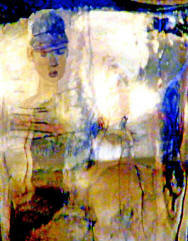 Joe exhibits at various galleries and events around Long Island, New York and also online. If you'd like to see his next exhibit, click here to contact him.